It’s early May, you’re looking at a rather marginal alfalfa stand, the haylage silo is nearly empty, and you generally use some corn silage in the dairy ration. Kill (plow or spray) the alfalfa stand now and plant a full-season corn hybrid, control perennial grasses and broadleaves with a post-emergence herbicide, and harvest the corn for grain or silage. Wait and harvest the first-cutting of alfalfa, plow and plant a short-season corn hybrid, figure on controlling perennial grasses and broadleaves with a post-emergence herbicide, and harvest the corn for silage. Keep the alfalfa stand for one more year. What are the advantages and disadvantages of each option? With Option 1, you give-up all alfalfa production on the field for the current year but insure maximum yields of corn silage from early planting and using a full-season hybrid. This still may not look too appealing if you REALLY need the alfalfa in the short run or if it’s a relatively new alfalfa stand and want to capture more return on the establishment investment. Chances are good that you will be taking another field planned for corn and seed it down to alfalfa. Hence, at least some establishment year yield will be recovered. With Option 2, you get some alfalfa production to fill short-term needs at the expense of reduced corn silage yields. Even with this option, you may be seeding another field to alfalfa that wasn’t originally planned (unless your other alfalfa fields are in good condition). With Option 3, you forego the additional corn silage production but increase the amount of total-season alfalfa harvested. The amount, however, will be reduced compared to a full, productive stand. How important are weather conditions? The best planting option to choose varies with each year and farm situation. The right decision usually is dependent on both early spring and June weather conditions, the latter of which can never be predicted at the time of the decision. Assessing alfalfa growth as of early May can be somewhat helpful. If growth is well behind normal, you can be sure corn won’t be planted until after the first week in June. At this point, silage yields are significantly reduced and may make Option 2 less desirable. Conversely, if growth is well ahead of normal from favorable April weather, the likelihood of getting corn planted before early-June increases. Where corn is to follow alfalfa, harvest the alfalfa as early as possible. Whenever Option 2 is selected, adequate rainfall has to come in June or the impending corn crop will be a disaster (this unfortunately has been confirmed from many past experiences). At the time of planting corn, the alfalfa has already depleted an abundance of reserve soil moisture and the subsequent corn crop has to have post-planting rainfall for early season growth and to compete with weed pressure. If you see that corn planting is not going to occur before the second week of June and soil conditions are dry, the least risk option is to keep the current alfalfa stand (Option 3). What is the yield and quality penalty for planting silage corn after first-cut alfalfa? Studies have been conducted at Arlington, WI to assess the yield and quality penalty for late-planted corn harvested as silage. In corn silage, a key quality component is the ratio of grain to stover in the forage. Less grain yield usually lowers silage quality. 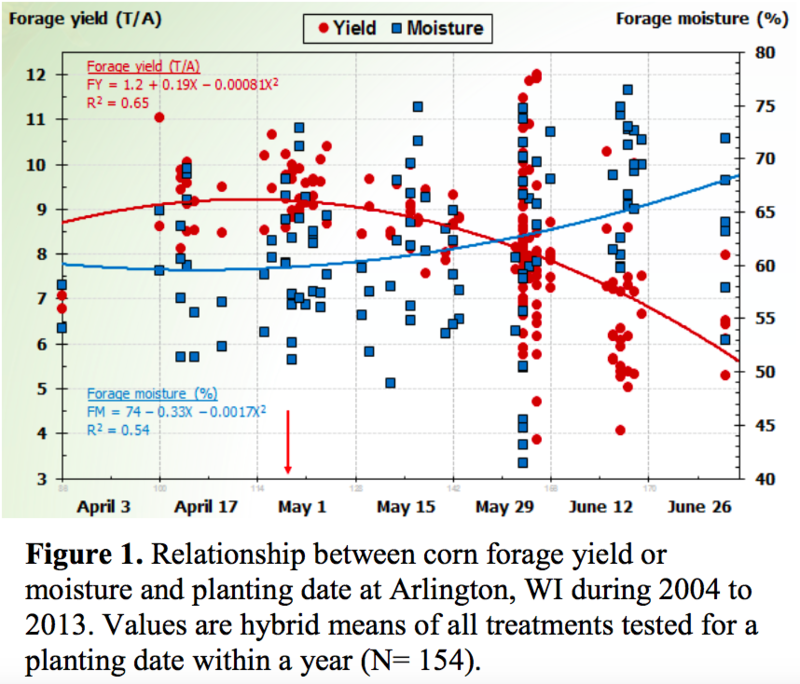 Corn forage yield decreases with later planting date (Figure 1). Forage yield of corn planted on June 1 is lower than earlier planting dates in May and April. By the end of June, yield levels are about 50% of the maximum yields observed around May 1st. 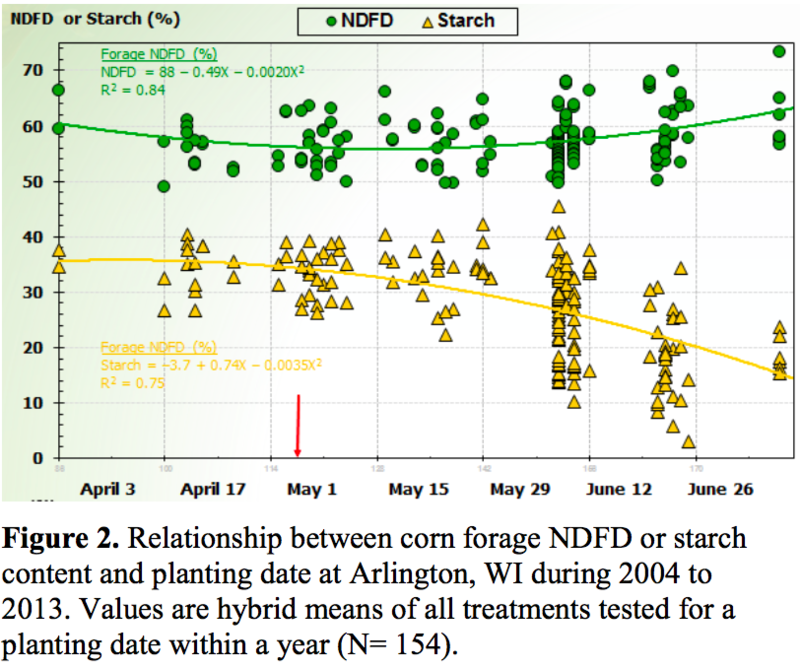 NDFD content is not affected; however, starch content by the end of June is about 50% of the maximum observed around May 1st (Figure 2). Later planting dates do not affect corn stover yield as much as grain yield, so the grain:stover ratio decreases with later planting date primarily due to lower grain yield. Lower grain:stover ratio results in less Milk per Ton for June planting dates than earlier April and May planting dates (Figure 3). Milk per Ton ranged from 3200 to 3600 lb milk / T for most planting dates in most years, however, the last planting dates in 1997 and 2001 had significantly lower Milk per Ton values. Multiplying forage yield by Milk per Ton results in Milk per Acre. 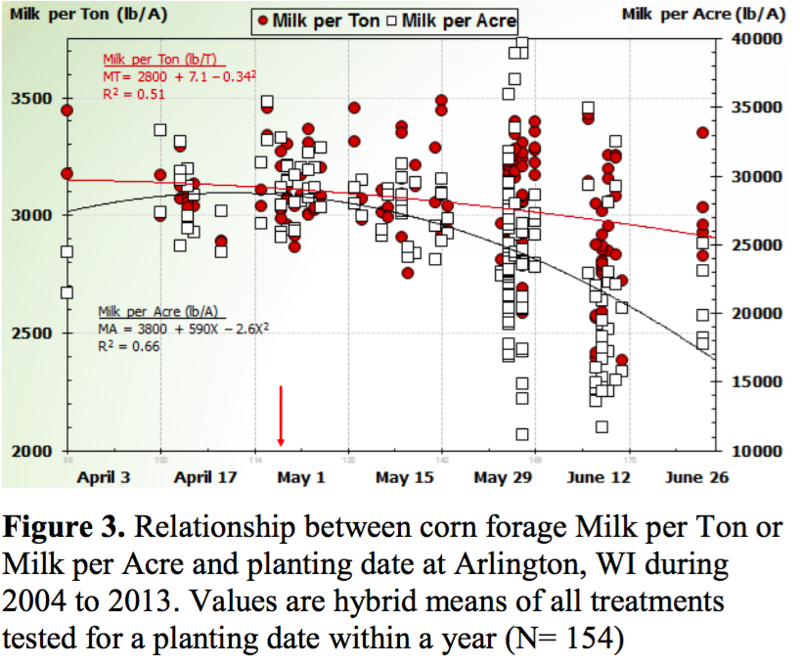 The relationship between Milk per Acre and planting date is shown in Figure 2. By May 20th, Milk per Acre yields are significantly reduced compared to earlier planting dates. Planting dates the third week in June produce Milk per Acre yields at 50% of the maximum levels seen for April and early May planting dates. Finally, when faced with late planting dates, choose appropriate short season hybrids to increase the probability that the crop will reach harvest maturity before the first fall frost. At Michigan State University, researchers evaluated and measured yields for two years using the three options listed previously (Durling et al., 1997). These results were then validated using DAFOSYM, a computer dairy forage modeling program. The modeling program incorporates long-term weather data and predicts growth and yields of both corn and alfalfa. Based on yields and production inputs, gross margins from employing the three options for each of twenty-six years was calculated. The highest overall gross margin was obtained by plowing down the alfalfa in early spring and planting corn for silage (Option 1) in 16 of the 26 years. This option also had the highest average gross margin across all 26 years simulated. Keeping the marginal alfalfa stand and harvesting four times during the growing season had the highest gross margin in 6 of the 26 years (Option 3) while taking the first cutting and planting corn for silage was the best option in only 4 of the years (Option 2). Corn silage yields when planted after the hay harvest averaged less than half of that where the stand was plowed in early spring and planted to corn. Economical yields from corn silage following first-cut alfalfa were only attained during long, warm and wet summers. Is it best to plow the harvested alfalfa field or no-till corn directly into sod? Wisconsin research during the mid to late 1980’s compared moldboard plowing to no-tilling corn into alfalfa sod following a first-cut harvest (Smith et al., 1992). Although the corn was harvested for grain, some comparisons are applicable. For all three trial years, corn emergence was reduced 8 to 20% under no-till compared to moldboard plowing. This was attributed to a dry soil surface. Although stands were over planted to compensate for plant density differences, no-till crop yields were reduced 60 and 20% in the two driest of the three trial years. In the third year, where moisture was adequate, there were no significant grain yield differences. Hence, no tilling into the alfalfa sod is an option, but much more risky if adequate rainfall doesn’t occur. What weed control options exist for late-planted corn following alfalfa? Weed management for corn following first-cut alfalfa offers some unique challenges as both the alfalfa and the weeds that will emerge in the corn crop require management. Terminating the alfalfa stand: Alfalfa stands (including weeds present) can be terminated with tillage, herbicides, or a combination of the two. If considering tillage, either use a moldboard plow, or aggressively chisel plow to ensure that taprooted alfalfa and perennial broadleaf weeds common to alfalfa are uprooted and do not resprout. This will also greatly reduce (but not eliminate) creeping perennials weeds like quackgrass. This type of tillage will require additional time to conduct and be more expensive compared to herbicide applications. Soil moisture can also be lost due to tillage, which can be an important factor in dry years. Minimum tillage can overcome some of these issues, but this will allow alfalfa and other weeds to escape control. They can be managed in the corn crop (see below), but need to be removed in a timely fashion to minimize corn yield loss. Because of these issues, growers often opt to use herbicides to terminate alfalfa fields. The advantages of herbicides are that they can be done faster, at less expense, and often have consistently better results in alfalfa termination and weed management without losing soil moisture compared to tillage. While a range of herbicide options are available, most frequently glyphosate is used. Applications not only provide good to excellent results at controlling alfalfa and all other non-glyphosate resistant weeds that are emerged, they allow corn to be planted after hay is harvested as no plant back restrictions exist with this herbicide. Many glyphosate formulations allow alfalfa to be treated with up to 1.5 lbs ae/A at least 36 hours before harvesting the alfalfa. This timing is recommended as it will allow for hay harvest, and improve effectiveness as weeds are larger and aren’t resprouting after being cut. This option will only work on non-Roundup Ready alfalfa varieties. Alternatively, herbicides could be applied after harvest and regrowth (at least 4 inches regrowth is recommended). While a range of options exist, typical treatments involve the use of 2,4-D or glyphosate. We recommend including one pint/A dicamba (0.5 lbs ae/A) to increase effectiveness on alfalfa. Check the plant back restrictions for each herbicide used, as restrictions are herbicide and rate specific. This could delay planting an additional 1-4 weeks. In-crop weed management: If the alfalfa termination was effective, most of the weeds that appear after planting will be annual weeds. If it is not, alfalfa and other perennial weeds will resprout within the first two to four weeks after corn planting. Monitor fields carefully. If resprouting of alfalfa and perennial weeds is occurring, apply postemergence herbicide applications as soon as possible to prevent delayed corn development. A range of options exist, but consider products that contain glyphosate, clopyralid, or dicamba as they are effective and registered for use at the spike stage. If annual weeds are mostly present, management can be delayed until corn is 4-8 inches tall. Use of herbicides or tillage should provide similar results. Select herbicides based on the weed species present. See the Pest Management in Wisconsin Field Crops bulletin (A3646) for detailed information on herbicides registered for use in corn: http://learningstore.uwex.edu/Assets/pdfs/A3646.pdf. What are the soil fertility considerations for corn following first-cut alfalfa? Alfalfa will provide nitrogen (N) to the subsequent corn crop at amounts similar to those provided if the legume was killed or plowed in the fall. However, because the crop is being harvested first, no additional credit can be taken for regrowth that is being returned to the soil. Additionally, because these stands are being terminated, in most cases they would need to be categorized as either “fair” or “poor”. Table 1 summarizes the appropriate N credits that can be taken for corn following first-cut alfalfa. On high corn yield potential soils, some additional N will need to be applied to meet the nitrogen needs for the corn crop. Refer to University of Wisconsin-Extension bulletin A3809 to help determine recommended nitrogen rates for specific conditions (http://learningstore.uwex.edu/Assets/pdfs/A2809.pdf). Appropriate amounts of phosphorus (P) and potassium (K) need to be applied in the corn starter fertilizer based on soil test levels. Even where P and K levels are extremely high, University of Wisconsin research has confirmed a high likelihood of starter fertilizer response with later plantings (Bundy and Andraski, 1999). A minimum of 10 lb. N, 20 lb. P, and 20 lb. K per acre needs to be applied as starter. Potassium may be especially important with corn following first-cut alfalfa because the initial harvest has already extracted a significant amount of K from the soil and corn silage is a high K demand crop. If the soil test level is not known, apply a starter fertilizer with a high K analysis or broadcast additional K prior to corn planting. Double-cropping corn for silage after a first cutting of alfalfa is a management option when forage is needed early in the growing season. However, the success of this management strategy is highly dependent on spring growing conditions (primarily heat units) along with early summer rainfall and must be done with the realization that corn silage yield and quality will often be significantly less than that of early- planted corn. The practice has a higher likelihood of success in southern Wisconsin than in the north. In Pennsylvania, where extension personnel endorse double-cropped corn after first-cut alfalfa, they are also quick to point out that such a practice is not very forgiving to poor management (Roth et al., 1997). Bundy, L.G. and T.W. Andraski, 1999. Site-specific factors affecting corn response to starter fertilizer. J. Prod. Agric. 12:664-670.